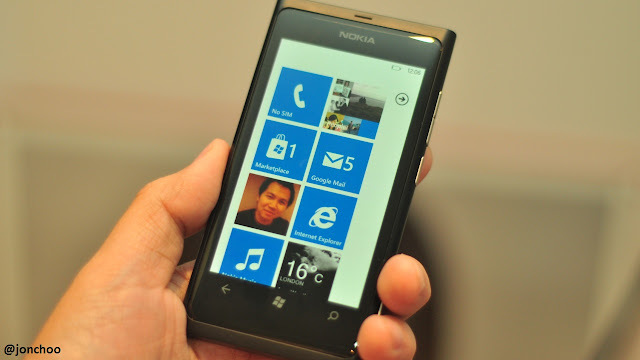 It has been more than a month since I switched to using the Lumia 800 as my main smartphone. Coming from using Android exclusively for six months, there are obvious drawbacks with Windows Phone 7.5, but these are few and does not stop me from enjoying the OS. Unlike pre-Mango WP7, WP7.5 does not make me want to hurl the phone with frustration for one, and after getting over the initial teething period - I now love it. Windows Phone 7 was designed with consumers, not geeks, in mind hence the lack of certain features we geeks take for granted. Nothing wrong with that, but if Microsoft wants to win the smartphone OS war, they need to also pander to the geeks. After all geeks rule the earth, or so that is the common saying here. Part of the problem with Windows Phone 7 is still the lack of apps, but that is changing. Everyday I keep seeing new quality apps get added. It even hosts the best Foursquare mobile client on *any* platform. Yes I have issues with it. I have a feature list request that can fill a novel if I weren't so damn lazy. But for most parts, it just works. It lets me get on with my life and spend less time poking through the settings to figure things out. Do not get me wrong, iOS is now so mature I am actually beginning to like it (gasp!) and Android will always be in my heart as a geek tool - but, to me at least, nothing beats the simplicity of Windows Phone. Most of the features you need are included out of the box, making it less likely to search for one on the Marketplace (which is dreadful at the moment, no thanks to Microsoft's poor search algorithm). But I do wish for some features that could only be made possible by Microsoft. For example, the ability to love tracks via the Zune popup player would be ace. I would also like to see the capacity for group contacts to be increased from 20 to infinity, and messaging apps like WhatsApp be integrated into the OS. Live Tile is a superb feature that I wish more developers would take advantage of. One such developer did, and he is Jeff Wilcox. His 4th & Mayor Foursquare client takes Live Tiles to a level that not many apps has taken advantage of (certainly not the official Foursquare client). Not only can you pin the application shortcut (with built-in notification), you can also pin venues and friends as shortcuts. And best of all, you can also pin a 'check in now' tile, a shortcut that takes to straight to the check-in page allowing you to check in quickly, and without fuss. The built-in email client is a joy to use, even more than the excellent GMail app on Android. When my notebook recently succumbed to a dreadful rootkit infection, I immediately switched to using my Lumia as my main email communicator whilst at home. New emails arrives almost immediately. The ability to see how many unread messages I have on the Live Tile is dead useful. Android used to have that capability, until Google pulled it for whatever silly reasons. I would argue, labels aside, that the Windows Phone email client is better than Gmail for Android. But Windows Phone 7 can be so much better. In fact it is still missing some pretty darn important features that can't be left ignored. For example the lack of reply-all and direct message support within the Twitter part of People Hub is rather irritating. Windows Phone 7 does not host any good Twitter clients yet, so these are features that are crucially missing. I often have to switch to my Android phone if I want to DM someone. Pretty unacceptable that they could not integrate such function within the Messaging app, where as they could with Facebook Chat. The lack of external card support also angers me. As a multimedia device, the Lumia 800's 16GB just isn't enough. Microsoft does offer 25GB of SkyDrive cloud storage, but do you honestly think it is actually a good idea to convince users that they can download anything they want from SkyDrive over a slow mobile network? Here in the UK, it would be almost impossible to use SkyDrive daily as the majority of networks have download limits and crawls to a speed not dissimilar to GPRS in urban areas. Even if Microsoft does not want to allow us to install applications onto microSD cards, at least allow us to store our media on it. I wouldn't even mind if the libraries are separated. As I said earlier, Live Tiles is a superb feature and one Microsoft should be proud of. But shouldn't Microsoft lead by example? Their very own World Clock app does not support the ability to pin clocks as a tile! There should be pin to support for sub-settings like brightness. If there's one thing I wish Microsoft would copy from Android (and now iOS) is a dedicated notification area. Sure, Windows Phone 7 now supports toast notifications, but if you regularly receive notifications like I do, I would like them to all be available to view or dismiss from a dedicated area. There's nothing wrong with copying something if it works well, and a pull down notification area will work well here. After all Android, iOS and Symbian all support pull down notification. Finally my biggest gripe. The poor file support by the OS. I do not mind using Zune desktop, even if I actually prefer to drag and drop. But the complete lack of support of ubiquitous video codecs like DivX and XviD by Zune and/or Windows Phone is irritating. I have not used the Lumia as a video player much because Zune would refuse to recognise anything I put inside my Video folder. At the very least, allow us to sideload none compatible videos. Third party developers will then do the rest. Many of my initial complaints I made a year ago about Windows Phone 7 has been addressed by the NoDo and Mango update, but while these updates has finally made it usable - the OS just isn't quite there yet. Microsoft has two more updates for Windows Phone 7 - Tango and Apollo (which many suspects will finally introduce further hardware support for the platform - such as dual core and HD screens). I do hope we will see some of the issues addressed with these updates. Other than that, Windows Phone 7 Mango is a fine product, completely acceptable for the majority of consumers. But like any vintage wine it aspires to be, it just needs some time to get the little things right. It is nice to see Microsoft making a OS that for once is geared towards ordinary consumers, but it's time to start thinking of the geeks and power users too. Here's hoping. Calm and level headed review. You made it possible this year. All the best to you.